Hello everybody, welcome back to EDR! Spoilers for Amonkhet start in less than a month which means we’ll have lots of new goodies to talk about and play with and until then we should focus on something that has just finished. With Kaladesh being completed, a lot of good artifacts have found their way into the format, not to mention lots of people playing artifact focused Commanders. Now that we have more tools than ever to work with, why not make an artifact Commander deck of our own? 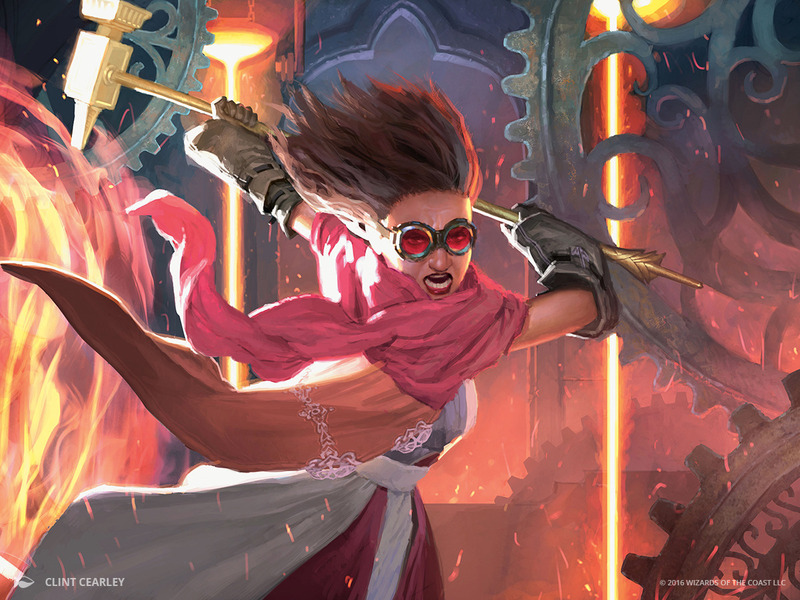 With the Commander 2016 decks being released in between the Kaladesh sets, the advent of four colour decks has arrived and started dominating metagames. EDH Rec is a great website for gathering stats and ideas on building your decks, and as of now Atraxa, Praetors Voice is the most popular Commander option, with Oloro, Ageless Aescetic and Meren of Clan Nel Toth not far behind. It’s safe to say multicolour has always been incredibly popular in EDH but the four colour precons really cemented that fact and pushed it over a cliff attached to a cement block. Everyone is playing four colour, which inadvertently leads most people playing artifact decks to play Breya, Etherium Shaper as their general. There’s nothing wrong with this; she is incredibly powerful, gives you access to all of the best tutors, coloured artifacts, support and combos, and is very powerful in her own right. 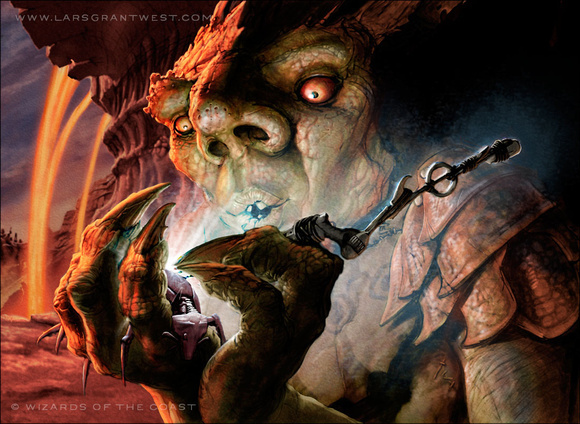 For the sake of getting a little breath of fresh air, I though we’d avoid Breya and instead return to everyone’s favourite goblin planeswalker, Daretti, Scrap Savant. Why Daretti and not any one of the other non-Breya artificers? Frankly it’s because of how bad Red is to play. Red is generally the worst colour in the format and mono-red one of the hardest decks to achieve anything with. Daretti takes what would be considered a challenge and turns it into a powerful stance: Red can be powerful because Red is powerful. It just needs the right tools. Some might argue that mono-coloured artifact decks are just slightly shinier colourless decks, the coloured cards really help seal the deal and do give a coloured identity to the deck. Daretti helps solve the two major issues that Red decks tend to have – card draw and midrange plays. Some people argue that Red needs access to better ramp, but when you’re playing a lot of mana rocks that synergize with your other cards, extra ramp that just happens to be coloured is more superfluous. Daretti fixes the actual problems by giving you some digging power with his plus ability; even if it’s not card advantage, you more often than not just need to be able to see more cards. This also happens to fuel his second ability which lets you exchange your Trash for Treasure. The second ability helps overcome Red’s other glaring weakness – a lack of midrange plays. Red has plenty of powerful late game cards like Avatar of Slaughter, Bogardan Hellkite and Insurrection, but often has issues getting to a point where they can cast them. If you’re not dedicating your early game to extreme aggression or ramp, you’re not going to be doing much in the midgame. Daretti solves this problem by forgoing the issue of casting your spells. Need that late game now? Just discard it and then cheat it out later. This doesn’t completely solve the issues in this area but it does help tremendously. It also helps add to a lot of Daretti’s power level – being able to cheat card costs has historically been the most powerful thing you can do in a game of Magic. By playing mono-red we also gain access to some very powerful and important hate cards – Blood Moon/Magus of the Moon and Ruination. If you or your meta frown on mass land destruction you can opt to ignore these, but their power level is undeniable. Being able to shut opponents out of the game is usually a game winning play. Blood Moon, ironically enough, feels like the much fairer of the two since it is not a permanent effect and can be removed. Being in mono-red already means the few utility lands you’ll lose will be a small price for keeping your opponents from casting spells. Ruination is a more permanent solution that actually destroys all non-basics your opponents control, meaning you can time it right to screw over the right player and avoid hate from the rest of the table. As mentioned before, with the abundance of multicolour and specifically 4 colour decks lately, you can really use these cards to punish greedy mana bases. Another strong hate card that doesn’t inherently limit our deck building is Stranglehold. While stopping Narset, Enlightened Master is kool, gimping everyone else’s ability to tutor will feel amazing and really help you keep hold of the game. It shuts off tutors but also has the more subtle effect of keeping your opponents off of fetchlands and Kodama’s Reach. Ooh, what’s this? Turning a Foundry Inspector into a Darksteel Forge you say? Trash for Treasure and Goblin Welder help us with more versions of Daretti’s minus ability by allowing us to cash in on one artifact for another in our yard. This gives us access to recurring important artifacts or just using them for value. Not to mention that Welder can target your opponents important artifacts. Giving them their Sol Ring back in exchange for their Planar Bridge when they already have 20 mana is probably a pretty good trade for you. Scrap Mastery is a very souped up version of these cards and is often the same power level as Living Death with a much smaller downside, since very few opponents outside Breya will be stocking their graveyard with powerful artifacts. Being able to surprise opponents out of nowhere by getting Darksteel Forge, Mycosynth Lattice and Nevinyrral’s Disk from the grave will be annoying at least, and will likely win you the game. Hellkite Tyrant is a hellkite of a card. A 6/5 flier with trample is some pretty solid stats already and the ability to steal artifacts is a powerful one to abuse. Add Mycosynth Lattice and you will not only steal an opponents entire board and threaten the rest, but you also gain a not unreasonable chance to win the game off of the Tyrant’s secondary line of text. But mostly it’s there to annoy opponents by taking their Sol Ring and sometimes wipe a player out with a well timed Lattice. Kurkesh, Onakke Ancient is a second copy of Rings of Brighthearth with a less expensive cost to it’s ability. Being able to double up on powerful abilities like Planar Bridge or Bosh, Iron Golem can really help you get ahead and having more redundancy for that effect is never bad. The downside is Kurkesh is easy to kill, is not himself an artifact and does cost red mana versus Rings’ generic cost. Slobad, Govlin Tinkerer is a pretty powerful commander in his own right. The ability to sac an artifact for free is really useful and keeps your opponents from casting their removal, since you can just sac a weak artifact to protect your powerful ones. Another upside is that you can sac your entire board to set up a winning Scrap Mastery play, similar to Krark-Clan Ironworks. Lastly, Pia’s Revolution is a new card from Aether Revolt that acts a lot like Athreos, God of Passage by punishing opponents for removing your artifacts by either bolting them or getting them back, and it also triggers off of all your sac outlets. Another key point is that the damage from Revolution can be redirected to planeswalkers if you have difficulty killing them otherwise. Winning the game will often be a grindy process where you beat your opponents via “Junding ’em out” with long term efficiency and value. If you need to suddenly end the game, Darksteel Forge + Mycosynth Lattice + Nevinyrral’s Disk/Oblivion Stone/Vandalblast is a powerful board wipe that hits everything your foes own and nothing on your own side. Another winner is infinite mana from Rings of Brighthearth and Basalt Monolith which then casts an infinitely large Walking Ballista to ping down everyone. Lastly a more traditional method is to use Blightsteel Colossus to vaporize opponents one at a time. This is very close to my personal Daretti list that I play, but I left out some of the more meta-specific options that my list runs. All in all this is a powerful build that may help your opponents re-examine their views on what Red can do. That’s all for this week of EDR; as always feel free to leave a comment or a question and I’ll see you guys next time. Commander, Daretti, Elder Dragon Recycling, magic the gathering, MTG, MTGDecktechs, Westin. Bookmark.